The Emory University Board of Trustees announced today that Claire E. Sterk, provost and executive vice president for academic affairs at Emory, has been selected as the university’s 20th president. She was elected by a unanimous vote of the trustees during its meeting in Atlanta. Sterk has been a member of the Emory community since 1995, when she was appointed to the faculty of the Rollins School of Public Health. During her tenure at Emory, she has served as the Charles Howard Candler Professor of Public Health, chair of the Department of Behavioral Sciences and Health Education, associate dean for research, and senior vice provost for academic affairs. She was named provost and executive vice president for academic affairs in 2013. Sterk will assume the role on September 1. She will succeed James W. Wagner, who announced in September 2015 his intention to retire at the end of August 2016 after 13 years as president. Sterk was the unanimous choice presented to the Board of Trustees by a 15-member Presidential Selection Committee that has dedicated the past six months to an intensive national and international search. 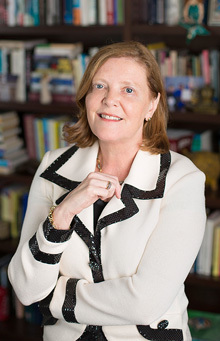 Sterk is the first woman to serve as president of Emory. She is a native of the Netherlands, where she earned her Ph.D. in sociology from Erasmus University in Rotterdam and her doctorandus degree in medical anthropology from the University of Utrecht. At Emory, Sterk has held faculty appointments in anthropology; sociology; and women, gender, and sexuality studies. Her primary research interests are addiction, mental health, and HIV/AIDS, with a focus on community-based interventions. She is a leading international figure in the fields of public health and anthropology and the author of three books and more than 100 articles and book chapters. In addition to service on numerous editorial boards, Sterk has held several professional leadership positions, including president of the Alcohol, Drug, and Tobacco section of the American Sociological Association and a board member of the Society for Applied Anthropology. Sterk’s husband and research partner, Kirk Elifson, serves on the faculty of the Rollins School of Public Health. Together, they have attracted more than $33 million in external research funding to Emory.